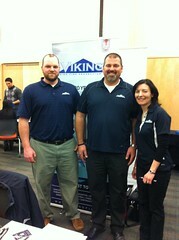 For a third year in a row, Viking participated in Seneca College's Job Fair. This event is an excellent opportunity to meet students eager to start their career at Viking. In the picture, from left to right, Adam Blunt (Toronto Design Coordinator), Steve Spearing (Toronto District Manager) and Tanya Moskovakis (Human Resources Manager).